Pauline Le Britton has been working on a series of painted harlequin panels in the Pop-up Artists Studios in Haverfordwest. The harlequin pattern symbolizes the idea of the Fool and all that is hidden beneath and the stories that he/she may carry. I have been looking at Folk and Travelling Art particularly painted barges. I like the idea of these beautiful decorative boats carrying symbols and scenes of their journeys and places they have witnessed – travelling art, on water. The boats were painted with scenes of castles, landscapes, mountains and flowers – places painted from memory of pictures they had seen on their travels. 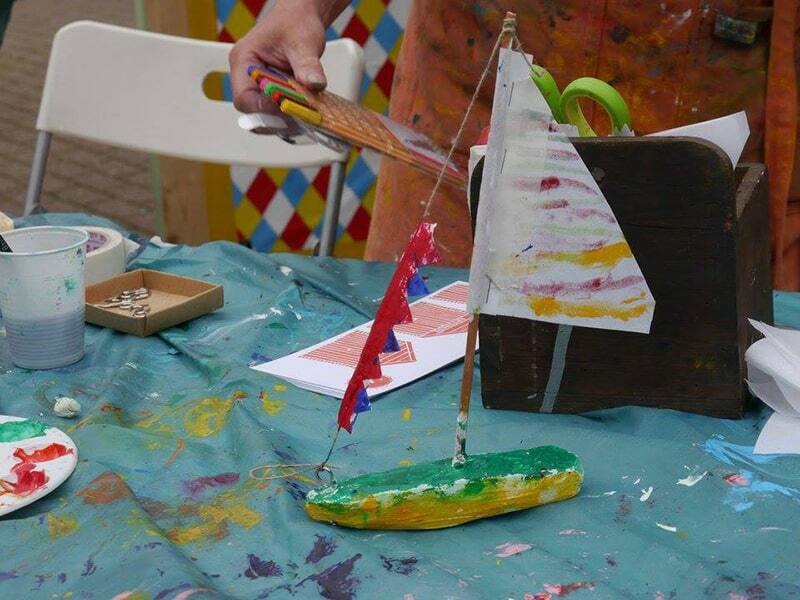 Pauline used this as a starting point for the Harlequin Shed, which set out to offer everybody the opportunity to share their experiences by decorating little plaster boats and making sails to describe their own stories and journeys. During the course of the week, 214 people participated in the project. The painted plaster boats were taken away, but only after a few notes about what the boat has seen in its life were documented on a postcard, which was left inside the shed.